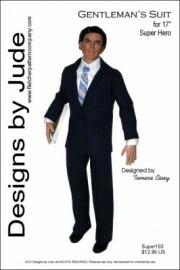 Up for consideration is a new suit pattern for 17" Super Hero dolls and Jacob Black by Robert Tonner. The Gentleman's Suit pattern includes a long sleeve dress shirt, pants, fully lined suit coat and tie. A similar design is also available for the 17" Matt O'Neill doll and the 19" Peter Pevensie/Mortimer Mort Dolls. The pdf version prints on 8 1/2 x 14 legal paper.